that hits just the right tone of adorable and funny, the creator with 9 million fans waiting with bated breath for her next vlog to post, or the epic ad that has people around the world doing splits. On YouTube, people choose to watch content that entertains, inspires and delights them. Over the past 10 years, brands of all shapes and sizes have come to embrace YouTube as a platform for their own creative expression, by making ads that people choose to watch. During this time, consumers have been watching, sharing and commenting on their favorite ads - ultimately informing which ones end up on our monthly YouTube Ads Leaderboard. Today, we’re taking this a step further. In partnership with the Webby Awards we've reviewed all of the top Leaderboard ads from the past 10 years and selected 20 finalists videos. 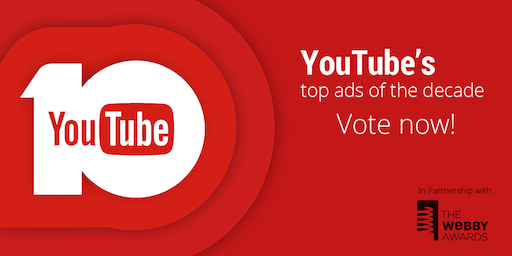 Now we need you - the advertising and creative community - to help us celebrate these iconic brands and choose which YouTube ad of the past 10 years is your favorite. From today through May 28th, visit 10YearsofYouTubeAds.com to vote. Check back here on June 3rd for the final results. For the past decade, YouTube has connected people with the content they love. Be it the home video that hits just the right tone of adorable and funny, the creator with 9 million fans waiting with bated breath for her next vlog to post, or the epic ad that has people around the world doing splits. On YouTube, people choose to watch content that entertains, inspires and delights them.